When a chimney and flue work well, it adds warmth and great ambience to a home, whether that’s for an open fire, stove or a boiler. When it goes wrong it can be cold, uncomfortable or dangerous. Many people don’t realise that getting a chimney and flue to work well takes more than adding a structure that looks in proportion to the top of a property. Chimney design is an age-old pastime and applies to the grandest of houses down to the smallest of cottages, but it requires an understanding of thermodynamics to get a chimney and flue working properly. Chimneys and flues are designed to vent hot flue gases. These gases may come from a fireplace, stove, boiler or furnace and need to be removed from the property as swiftly as possible. Chimneys are the external structure that house the internal flue. Each fireplace, stove or boiler has to be served by its own flue, but a chimney may contain more than one flue. If you have ever marvelled at the size of the chimneys on a grand old country house, it is because they have had to be designed to accommodate many flues, often on different floors of the property. 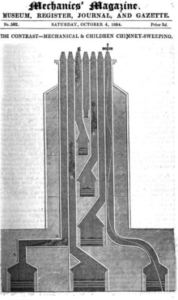 The picture below shows a cut through of a chimney from an 1894 edition of Mechanics Magazine with one chimney containing seven flues. Ideally, a flue should allow hot gases to vent into the atmosphere as quickly as possible, any bends in a flue are likely to slow the progress of the gases and could become a depository for creosote to build up and increase the risk of a chimney fire. How can Turner Baker help? As an example, we work closely with a number of building companies on both new build and renovation projects. Using our expertise to specify flue and chimney requirements for builders to complete themselves or working as part of a team to complete the work alongside the building company. One of the chimney problems that we are regularly asked to provide consultancy on which is very important to get right at the design stage – is getting the correct flue size. This is true for whatever appliance you are using the flue for, a boiler, stove, open fire – if the flue size isn’t correct, it won’t work properly and could prove dangerous. For instance, if you are hoping that a multi-fuel stove that requires a 6” flue liner will work fine if fitted to a 12” diameter unlined chimney, it won’t. The smoke will slow down immediately as it leaves the multi-fuel stove into the large unlined cold flue and you will very quickly find a dangerous build-up of tar and other deposits on the sides of the chimney. The other downside of attaching a stove to an overlarge flue is that it will affect the draw. The smoke will slow down and cool as the flue is too large to draw the smoke away from the multi-fuel stove efficiently and it won’t work nearly so well. The temperature of the flue has an important role to play in the efficiency of a multi-fuel stove – if it’s too big the smoke will cool straightaway and it won’t draw the smoke away from the fire. Turner Baker provides a consultancy service working alongside homeowners and architects to establish the correct flue size for the corresponding fireplace, stove or boiler and for open fires the optimum opening size. The fireplace opening to flue size ratio is a critical one, get this wrong and you risk either a fire that doesn’t draw properly or a room that fills with smoke. Turner Baker are also often asked to provide consultancy on older properties where homeowners want to reinstate a fireplace and flue that have been boarded up and unused for many years. This can be an interesting task, peeling back the layers of history to unearth the original structure underneath. It is vital to involve someone with knowledge of chimneys and flues during this process, to carry out necessary tests to ensure that the flue and fireplace are still fit for purpose. It is not unusual for fireplaces to be remodelled during the lifetime of a property – often more than once – and it is important to go back to basics and make sure that the size of the opening is compatible with the size of the flue for an open fire for example and the that the flue has not fallen into disrepair. These are just a few of the ways that our experienced chimney professionals can help to make the difference to getting a chimney and flue to work well. Importantly, it is always easier and more cost effective to provide expertise at the beginning of a project than it is to try and rectify a chimney or flue that you discover doesn’t work when a project is completed.